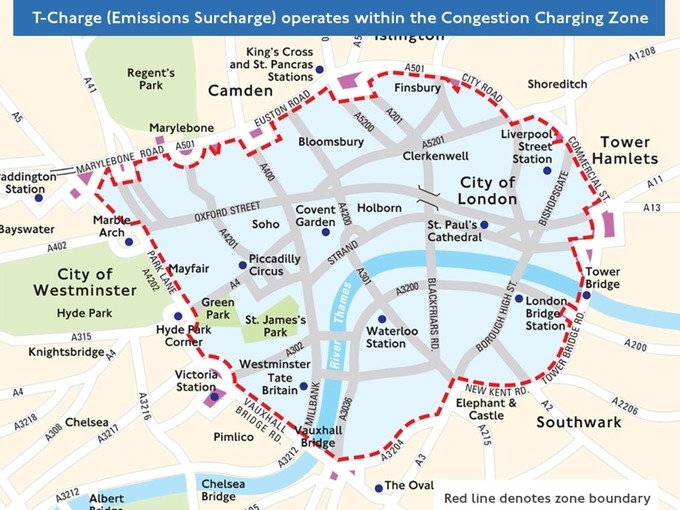 The new London T-Charge - what is it and who will be affected? The London T-Charge - What is it? Where and when is the T-Charge active? Covering the same areas in central London as the congestion charge does currently, drivers will now have to pay between 7am – 6pm on Monday – Friday. Bank Holidays and the week between Christmas and New Year are excluded. Any petrol or diesel vehicles that breach the Euro IV emissions standards will be forced to pay the charge (these are vehicles generally built before 2006) – this can include anything from cars, vans, coaches, minibuses and HGVs. Who is exempt from the T-Charge? Excluded vehicles include: Emergency Vehicles, registered TfL Taxis and mini-cabs, and recovery vehicles. If you are a resident living within the charge zone or a blue badge holder you will entitled to a discount. The T-Charge will use the same payment system currently used for the Congestion Charge, from Monday October 23rd, the TfL will identify the vehicles that will be subject to the T-Charge who will then go on to pay both the Congestion and T-Charge in the same transaction. What happens if you don’t pay the T-Charge? If you are driving or operating a registered vehicle in the zone and do not pay you will receive a £130 Penalty Notice, this will be reduced to £65 if paid within 14 days.